The first ever FIM Ride Green Eco Enduro has wound up in Copenhagen and what it lacked in the "BWAP-BWAP" sound track department, it sure seemed to make up for in fun and camaraderie. 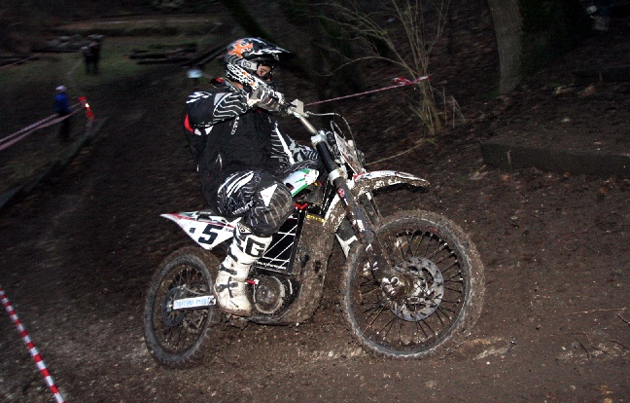 Once the mud had settled, the winners were announced with Fabien Planet (pictured above) the top guy over the forest portion of the event and Vanja Kollmann named the fastest woman. Stefan K. Olsen, riding on his home soil, garnered the most points in the supermoto street course superfinale for the men and Annie Seel turned in the best finish amongst the ladies. The field turned out to be completely dominated by Quantya bikes, though there was a sole Zero MX doing a fine job of representin' for the American manufacturer. In fact, its rider, Tommy Heimberg, was recognized with a "fair play" prize for his mid-pack effort. There was a lot of talk during the intense three-day event about the electric bike being the future of off-road riding though for us, it seems to be doing pretty well in the here and now. Hit the jump for a great video of some of the action from the first two forest days plus footage of a street heat featuring the eventual winner doing his checkered-flag thing. Eco Enduro ends in win for Planet [w/VIDEO] originally appeared on Autoblog Green on Mon, 14 Dec 2009 19:59:00 EST. Please see our terms for use of feeds. 0 comments on "Eco Enduro ends in win for Planet [w/VIDEO]"